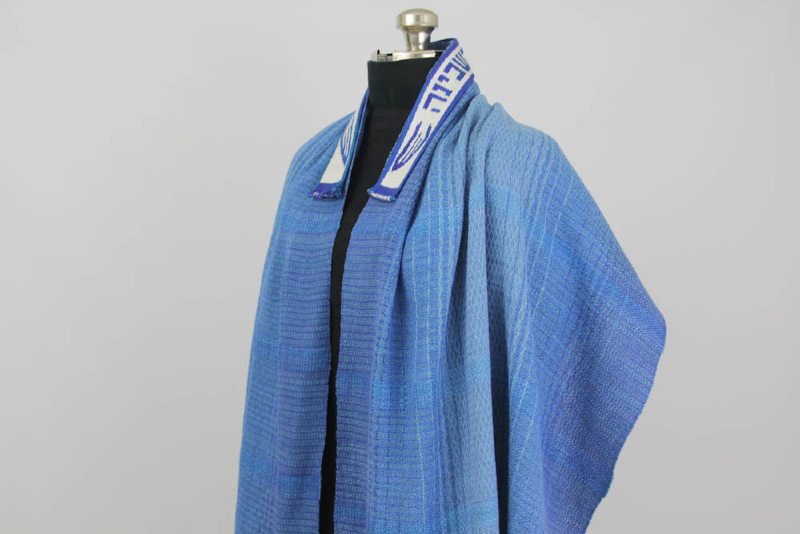 Say the blessing for donning tzitzit and then let one of these handwoven tallit settle lightly on your shoulders. 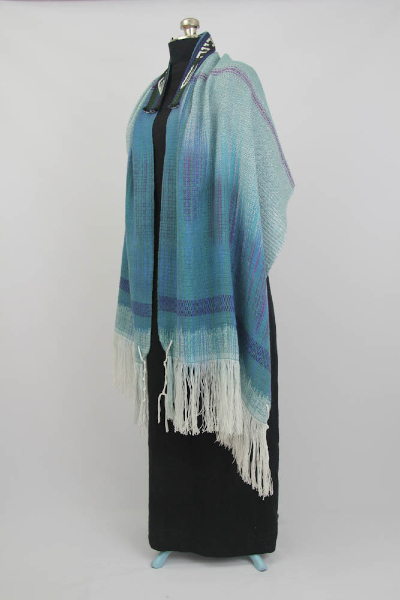 Let its soft drape and elegant, shimmering colors connect you with the beauty of Divine Spirit. 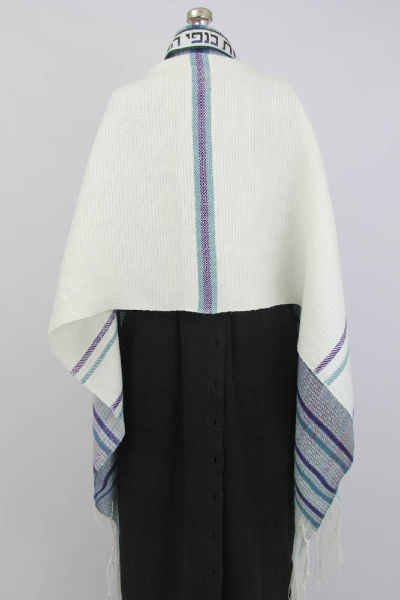 Know that this tallit was made for you with the intention of hiddur mitzvah (beautifying a mitzvah). May you feel sheltered beneath the wings of Shekhinah when you wear one of my tallitot. 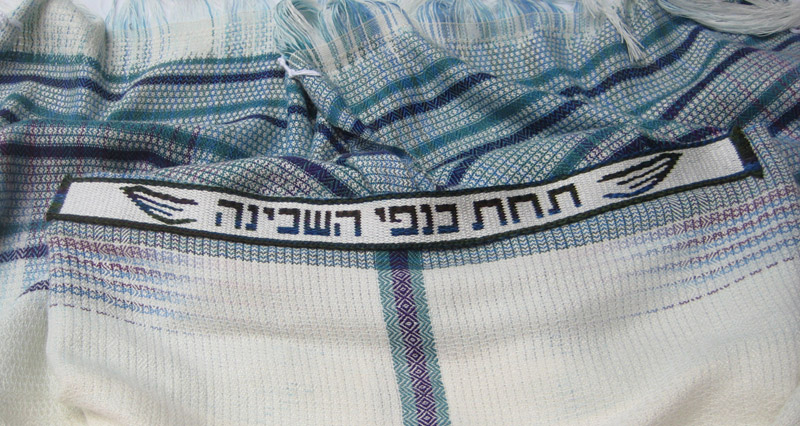 These are examples of my ‘Color Harmony’ tallit. 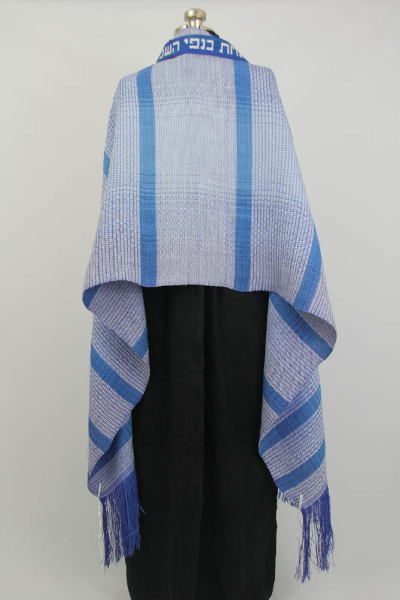 Three shades of blue linen are combined in the warp to create subtle stripes that shift to from dark to light. 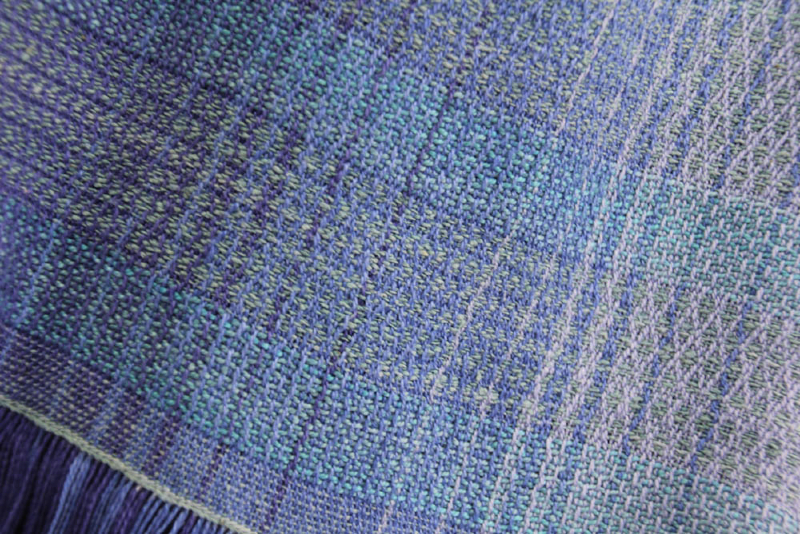 The blue weft is a spun silk that was space dyed in three very similar colors that add depth and interest to the cloth. The white weft is a smooth spun silk in a natural white that is very soft to the touch. 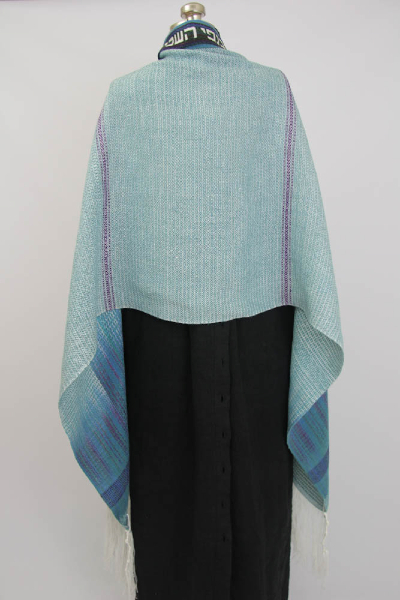 The accent stripes for both are space dyed cotton. Click on image to enlarge, click again to close. 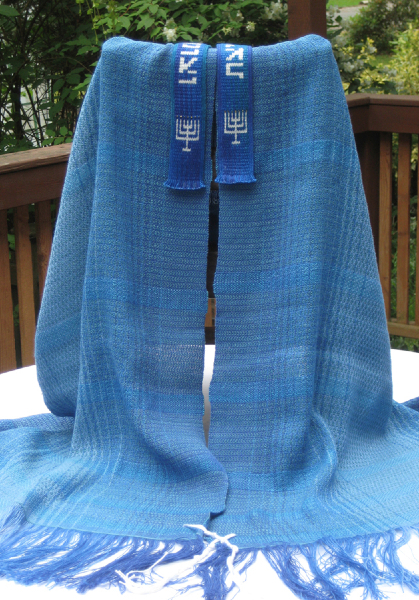 These are examples of my ‘Color Cascade’ tallit. 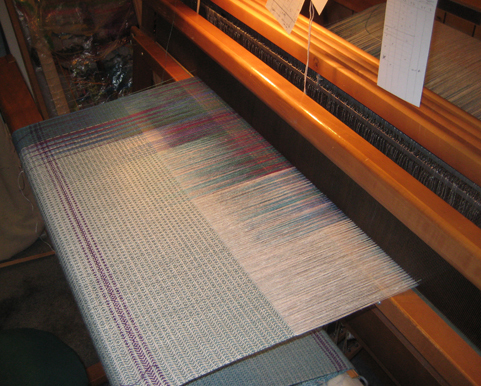 The white linen warp is wound in sections and painted with fiber reactive dyes in a cascade of colors before being threaded onto the loom. 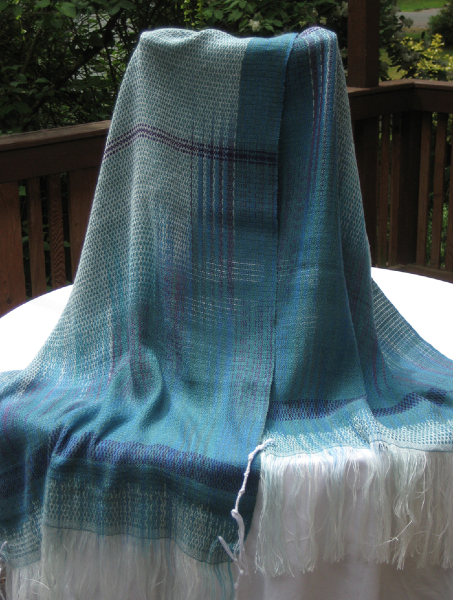 The teal weft is a tencel yarn. 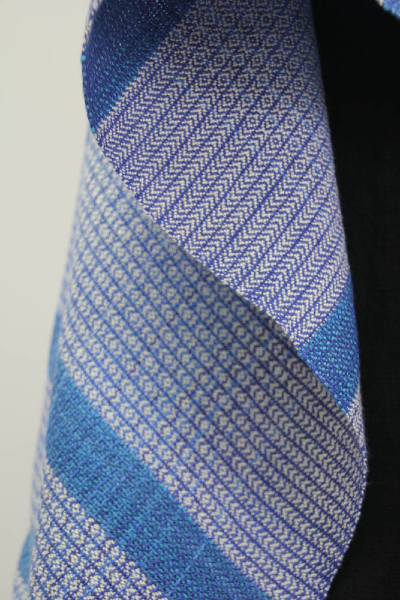 Variations of weave structure add stripes of subtle interest to the cloth. The white weft is a smooth spun silk in a natural white that is very soft to the touch and gives this fabric an amazing drape. 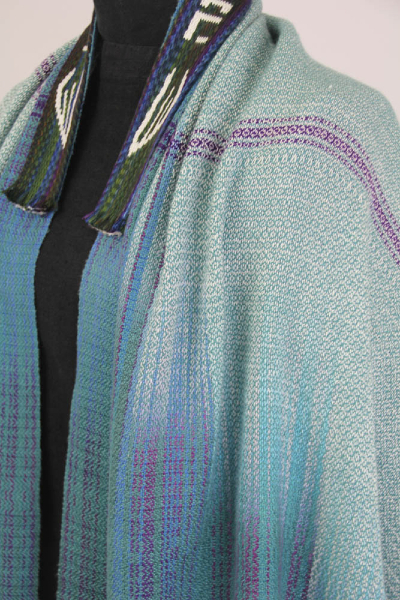 The purple (and teal) accent stripes are also tencel. 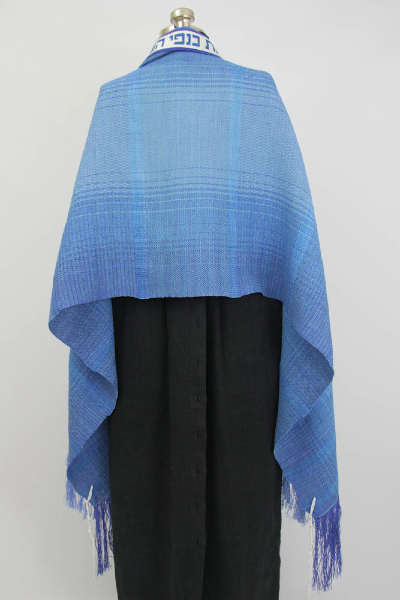 Tallitot are handwoven in linen combined with silk, cotton or tencel. Size: approximately 24” x 90” includes 7” of fringe on each end. Custom orders are welcome. I can vary the colors, the size, or the fiber choices. Please contact me or visit my etsy site to purchase from current stock. 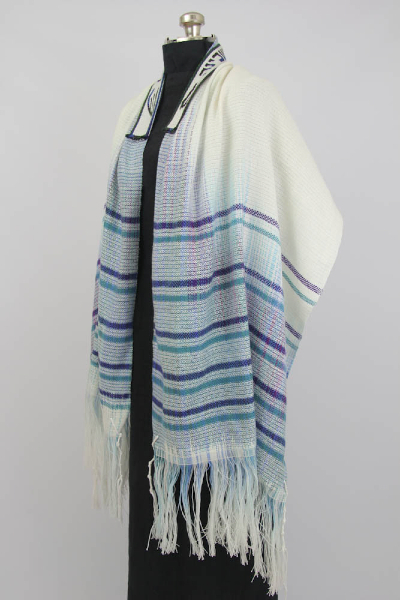 Color Harmony Tallit are $900.00 with a tablet woven atarah or $750.00 without. 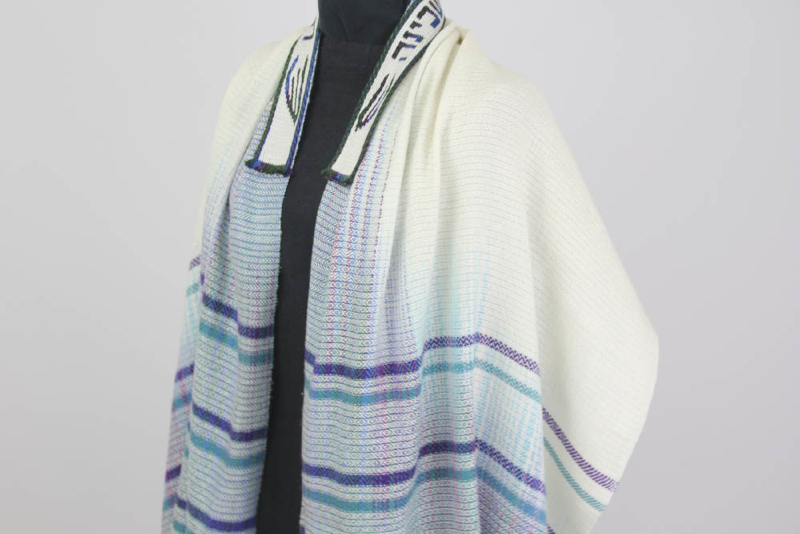 Color Cascade Tallit are $1,200.00 with a tablet woven atarah or $1,050.00 without. Taxes and shipping are additional. 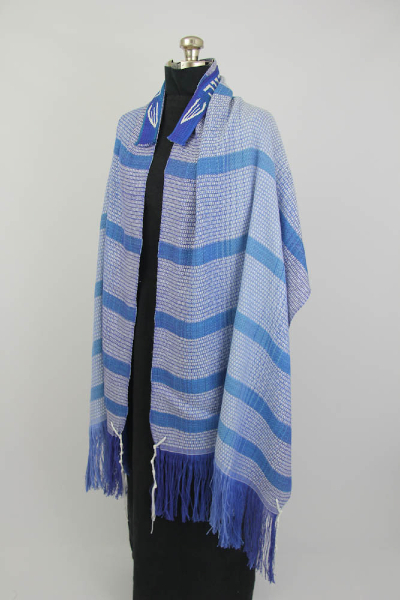 Make your tallit extra special with one of these atarah. Create a treasured gift for a bar/bat mitzvah or to honor someone for a special occasion. 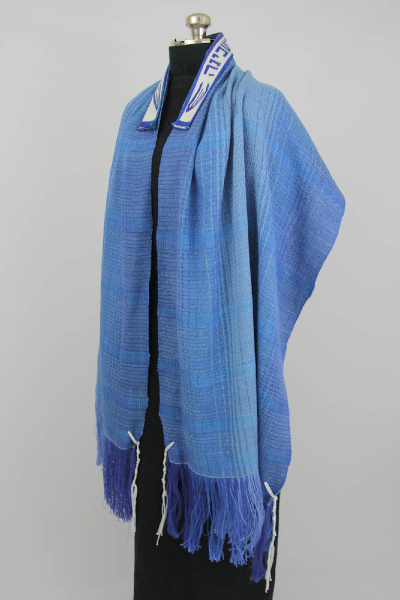 Designed to coordinate with my handwoven tallitot, they can also be sewn onto the fabric of your choice. 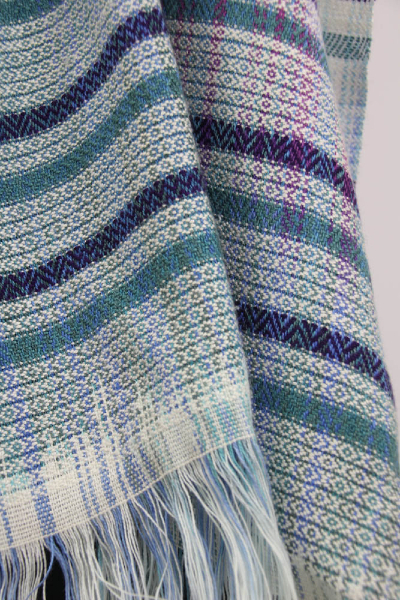 The bands are handwoven in tencel, bamboo rayon, cotton or a combination of these three fibers. Average size is approximately 1-3/4” wide x 22-24” long. See more examples in the galleries above. Custom orders are welcome. I can vary the text, end designs or colors. Please contact me or visit my etsy site to purchase from current stock. Wing design, Menorah, Six pointed star. Price is $150.00 for one of my standard designs. Taxes and shipping are additional. Additional charges may apply for unique custom orders. Tzitzit: for custom orders I am happy to tie them for you, or send you pre-cut threads and directions so you can do this mitzvah yourself. For those interested in the laws regarding tallit, to the best of my knowledge, the only restriction is to not mix linen and wool. 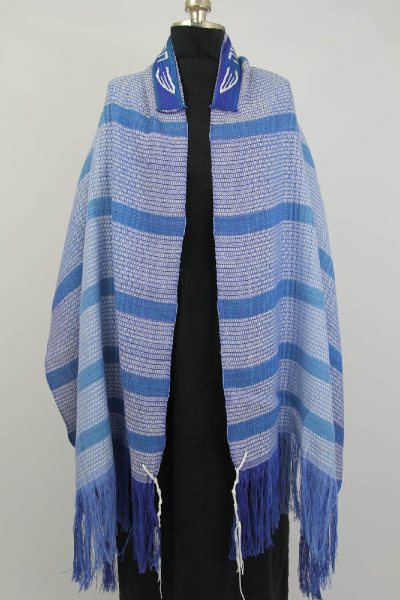 Inspired by weaving the bima cloth for the Women’s Torah Project, I am now weaving tallitot and atarah. This brings together my two biggest passions–anything fiber related and spirituality. 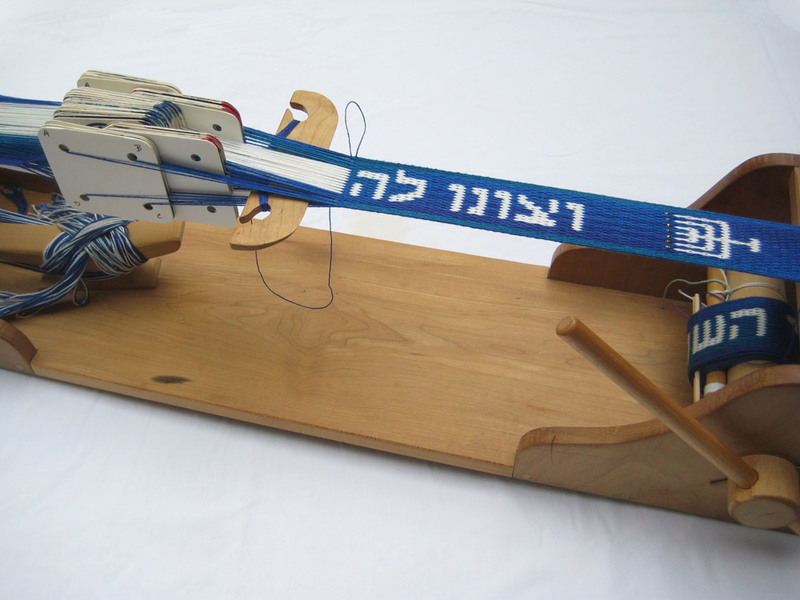 My way of pursuing tikkun olam is to make beautiful objects for people that support their spiritual practice. 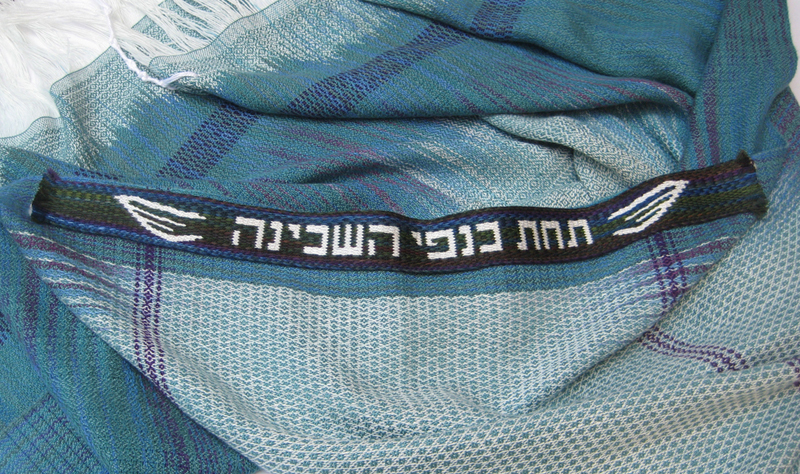 I weave each tallit with the intention that it is for somebody. I think about each potential buyer and ask what they would want and let that help guide my decisions. I belong to a Reconstructionist Jewish Community, and I do not work on Jewish ritual objects on Shabbat.